The United States Mint revealed it's sensational 1 oz Lady Liberty High Relief Gold Coin coin in a ceremony at the Department of Treasury in Washington, D.C. on January 12th. The 2017 coin marks the 225th anniversary of the Mint and the start of a year-long celebration of its history, tradition and prestige and it will be available at coininvest.com from its launch on April 6th, 2017. Each 1 oz Liberty Gold 2017 coin pays homage to the country's commitment to liberty and diversity with a beautiful image of the head of Lady Liberty as an African-American woman. It's the first time in the history of the nation's currency that Lady Liberty has not been portrayed as white. 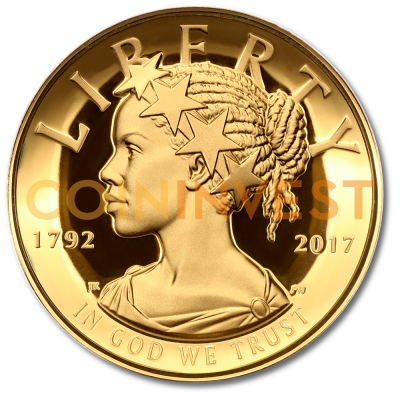 Lady Liberty 2017 is part of the new biennial Liberty Diversity series and future coins will portray Liberty as Hispanic, Indian and Asian-American.The portrait for this 225th-anniversary edition was created by Justin Kunz, Artistic Infusion Designer for the Mint and sculpted by Phebe Hemphill. The design includes the artists' initials, JK and PH alongside the dates 1792 and 2017 and the inscriptions LIBERTY and IN GOD WE TRUST. The reverse shows the iconic American Eagle in a new image designed by Chris T. Costello of the Mint's Artistic Infusion Program and engraved by Michael Gaudioso. The initials, CTC and MG are also featured along with the 'W' mint mark of the West Point, New York facility. Additionally, raised lettering reading 225TH ANNIVERSARY and 13 five-point stars grace the coin's edge. Lady Liberty 1 oz Gold 2017 coins are supplied in a wooden gift box with a 225th-anniversary commemorative certificate.